I did not know the Amazon stretched all the way up to Mexico but what we have here is more of that Amazonian psychedelic cumbia, known as chicha. It's a weird take on 60s bubblegum music, rooted in its own way in American pop though as different as say the Cambodian version we already know well from bands like Dengue Fever. This is the third outing from the Mexico City combo who have added touches of mambo, cha cha, danzón and Colombian porro to the mix. It is still predominantly the cosmic- glitterball-reflecting loping cumbia on Farfisa and spiny guitar that started from Pucallpa, Peru, in the hands of Juaneco y su Combo in 1969, and made it as far afield as Brooklyn when Chicha Libre got into it a decade ago. The beat is relentlessly "up" — this is a 9-man band so there's room for timbales, guiro, flute and even a theramin. There's an (instrumental) cover of "Quién será?" by Pablo Beltran Ruiz, which became a hit as "Sway" recorded by Connie Francis, Dean Martin and others. There's lots of fun and games, like "Mambo Egipcio" which could accompany a silent movie of battling bedouin. And speaking of silence, the last track has a long pause in the middle which made me think my speakers had become unplugged or I had muted them accidentally. I wish they wouldn't do this; maybe just have dim crickets chirping if they want to insert space? 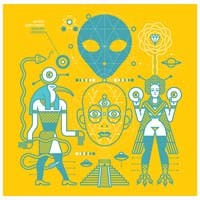 Then the last ninety seconds beam down extraterrestrial rays from another soundtrack. From Victor Jara to Violeta Parra, and from Cuarteto Mayarí to Os Mutantes, many Latin artists have recorded songs that have become classics while having significant lyrics, either poetic or protesting social injustice. Some of these artists risked their lives to bring their message to their audience. Ani Cordero, founder/drummer of the Mexican rock band Pistolera, has gone through the songbook from the 1930s through the 1970s, researching artists and political movements, to gather some of the greatest Spanish and Portuguese songs of love and struggle from Latin America. Puerto Rican-born Cordero now lives in Brooklyn and has played with Os Mutantes, the Brazilian psychedelic rock group who emerged as part of the Tropicalismo movement spearheaded by Gil and Veloso. Os Mutantes went through several breakups and reunions, the one constant being singer and guitarist Sergio Dias who remains an influential figure in Brasilian music. 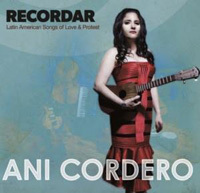 Cordero took up the percussion role once ascribed to Rita Lee in the band, but on this disc she is the frontman and is backed by Dias on bass and electric guitar. He was also able to bring in his own suggestions, for arrangements as well as instruments (I suspect that's him with the occasional atmospherics). So in addition to her own playing and her core group of piano, guitar, drums and percussion, she has ngoni, cello, accordion, trumpets and flugelhorn, to add limitless variety. The guest musicians have played with Lee Perry, David Byrne, The E Street Band, Vieux Farka Touré, and others. The lyrics are not included in the disc but can be found here, complete with English translation! Comparing Cordero's version to some of the originals on youtube I have to say she really occupies them and has made them her own. Latin American music fans, in particular, will cherish this disc. There's something appealingly rough and ready about this album. I guess it's the vocals which are a bit harsh, and the full-tilt quality of the tiny stringed instruments which are strummed to their limit. 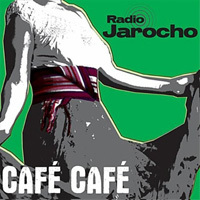 Radio Jarocho sound like a traditional group; nevertheless there is only one cover song on here and nine originals. Patricio Hidalgo appears on "Bemba y tablao," otherwise it's a straight shot of them featuring jarana (tiny 8-stringed guitar), requinto (bigger, but still smaller than a regular guitar), punteador (which seems to be a flamenco-style of guitar plucking), leona (another small intrument this time with four strings and pitched lower, like a baby bass? ), marimbal (I'm guessing a xylophone), and zapateado (-- again the net is suggesting a dance or style of music rather than an instrument). I hear cajon in there, and other percussion, which may be stamping feet (the zapatas?). The woman in the line-up is not Leona but Julia and she is the zapateadora, hence I am thinking she stamps her feet like a flamenco dancer. So you get the picture: lively son jarocho, played on traditional instruments, but more foot-tapping than foot-stomping to my ears. Still very engaging and worth a spin. I caught this act on Sabado Gigante: guys in cowboy hats and gals in hot pants & cowboy boots with their thumbs in their belt loops doing a two-step line-dance. What grabbed me at once was the romping bass played on euphonium. 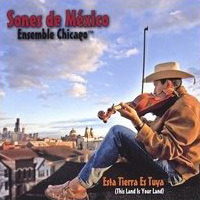 The title song is so great I bought the CD and while "Una vez más" is the outstanding track, it's a good half hour (26 minutes actually: ten two-and-a-half minute songs) of lively Mexican oompah music. 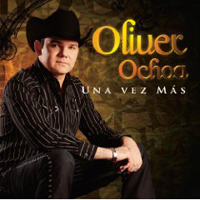 In general I prefer instrumental brass bands and it's a shame Ochoa is the focus because his singing gets wet and nobody gets any credit apart from Omar "Pony" Loredo who is the arranger, musical director and sound engineer -- so probably one of the saxophonists. Ochoa comes from Sonora, Mexico, and played accordeon as a lad in a group with his older brother. After musical studies in Guadalajara he got a start with Banda el Recodo ten years ago, and that experience led him to form his own brass combo. He has written over 100 tunes which have been covered by many acts including Rogelio Martínez and Graciela Beltrán. In addition to the great clash of brass there is a tight snare drum and a bass drummer. The snare bursts in with fast trills and reminds me forcibly of the mechanical drums you hear in barrel organs or orchestrions, adding to the carnivalesque atmosphere. The circus mood also brought up another buried memory: The Magic Roundabout was a short animated cartoon on BBC at 4:55 in the afternoon which I watched regularly as a young teen. It was actually a French show but the BBC hired Eric Thompson (father of Emma) to write absurd commentary for the show that involved magic mushrooms and lots of absurd humour. The music was dissonant circus brass, probably from the BBC sound archive, and it lodged in my subconscious to resurface now. I can practice my Spanish on simple ditties like "Sin tu amor," or ignore Oliver and concentrate on the tight horn interplay of Pony & his boys. The second best track is "Hoy te propongo," which is also catchy, but there are quite a few good riffs in here and Ochoa does manage to hold his own against the wall of sound. "Por primera vez" is a ballad, rather like a slowed-down version of the opener. You can see the music video of the title cut on Youtube, but you have to wait through thirty seconds of patter to get to it & it's a playback without the brass band. However once that euphonium walks down the intro it's two minutes of brilliance. Crank it up! Traditional Mexican son, 100% acoustic, with a twist. The twist being these are Mexican migrants living in Chicago who have embraced North American & European music and absorbed it into their eclectic repertoire. The first sign that something is askew is when they launch into the title cut, "Esta tierra es tuyo," and you realize it's Woody Guthrie's "This land is your land," and the full irony of it slaps you like a wet haddock across the jowls. So you shouldn't be surprised when they launch into Bach's "Brandenburg concerto no 3" with donkey jaw and guiro percussion. There is a guest brass quintet to fill it out, but it is truly fantastic the way they turn this into a lively son. The harpsichord continuo is played on a Jarocho harp and two Jarana guitars. There's a foot-stomping percussion break that Johann Sebastian "Big Daddy" Bach would love. Most of the other tracks are traditional sones, really well presented, with another oddity (which could almost be argued is traditional Celtic music), Led Zeppelin's "Four sticks." They take the asymmetric rhythm of this piece and really amp it up a notch with five strummers strumming: on two Jarana Rhythm guitars, mandolin, tricordio and requinto, then add ocarina and conch shell, and a whole bunch of percussion instruments with unfamiliar sounding names (and a vibraslap!). I imagine the novelty will wear off, but for once I miss having a radio show so I could throw this into a set and really surprise listeners! The Duchess & I are getting psyched up for a trip to Mexico. 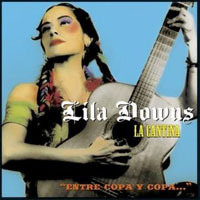 To help us prepare is this musical tour from Lila Downs, the husky-voiced señorita from Oaxaca. She made a big impact with her version of "La Sandunga" a few years ago. I saw her perform at Stern Grove last year after her Latin Grammy win and was disappointed. She had a sore throat and, when you listen to her sing, you can tell why. She really pushes her vocal range and belts it out, so, like Beny More and others, that may ultimately prove her downfall. Though I am a very verbal person I have a hard time talking about what moves me in music (really), and furthermore, I often prefer not to understand the words so my brain can go elsewhere when I am listening to music. LA CANTINA is about cooking and food which is good until Señorita Downs sings in English and it seems patently absurd. Then I started listening to the Spanish lyrics and it does seem to be a passionately sung cookbook. So is she having us on, or do Mexicans really feel that way about their molé? (When I went to the Yucatan friends told me the food was fabulous. I spent days looking for a decent meal in Merida and got home to learn the great cuisine there was Lebanese!) However the saving grace of LA CANTINA is the arrangements are great. There's a lot of variety -- from ranchera, which is the main ingredient, to mariachi to rock to a great one-drop cumbia, "Agua de rosas." The master Flaco Jimenez shows up, lending his legendary accordion skills. There's a hint of rap, but nothing too alarming. Another odd gem unearthed by IJ. He warned me to start it at the 7th track, saying there was some brass band stuff I might like (--that would be track six in the New Math). 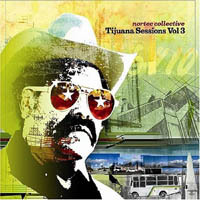 Nortec stands for Nortena + Techno and apparently it's a whole movement in the discos of Tijuana. It's a blend of Nortena accordion, dub and pop, run through a Mexican disco with hints of Ozomatli and even Talking Heads. Someone called it Tex-Mex on acid. The second track, "Tijuana makes me happy" (in English), sounds like New Wave from the late 70s with street sounds and twiddly synth adding to the happy accordion. It reminded me of "Honest Cecile" by the Gogos. But apart from the extreme quirkiness it demonstrates considerable sophistication on the part of the bass and accordion players. Funk is up next, with acid jazz trumpet. All sorts of odd ideas flash through my mind: Grace Jones' WARM LEATHERETTE album with Sly & Robbie, comes to mind, but restated in an accomplished manner rather than just emulated. The banda part is very much the oompah-polka sound associated with Banda Sinaloense but played by a trumpet on echo with layers of techno beat. This album represents the best of the lot (there's also a VOLUME 1; vol 2 featured one of the artists, Bostich). It's repetitious and heavy on sound effects and undoubtedly will wear thin in a few months but right now it's trippy and enjoyable. Great driving music -- but not if it makes you thirst for a bucket of margaritas!